In the first few months of 2018 there were many defining moments, for our country and for Americans for Limited Government. Because of you, The Department of Housing and Urban Development is ending the federal takeover of local zoning. You’ve directly assisted in restoring federalism from this Obama regulation. Because of your support, Americans for Limited Government led the opposition of the Affirmatively Furthering Fair House (AFFH) with the help of Rep. Paul Gosar (R-AZ) and Senator Mike Lee (R-UT), which prevented federal funds from being used by the federal government to take over local zoning authorities. Americans for Limited Government argued that HUD Secretary Ben Carson’s moratorium on implementation of the AFFH regulation until 2024 would be subject to legal challenge and the best way to protect his efforts was for Congress to assert its Article One spending authority. Congress agreed by asserting its Article One powers of the purse to include prohibitions on implementing the most egregious parts of the regulation in the Omnibus bill in the culmination of nearly four years of consistent effort by Americans for Limited Government to protect local zoning authority from being taken over by the federal government. 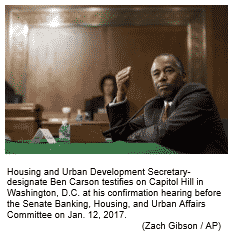 Department of Housing and Urban Development Secretary Ben Carson for just rescinded the Affirmatively Furthering Fair Housing local zoning assessment tool, and now Americans for Limited Government is pushing for full rescission. Because of you, America is one step closer to being and staying safe. You played a critical role in alerting President Trump to the takeover that would have crippled our national defense. 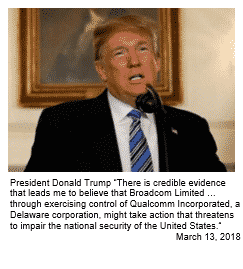 Americans for Limited Government took aggressive action urging the President to stop the takeover of Qualcomm (a US based company) by a Singapore based company due to both its economic and national security implications. The Trump Administration acted quickly and decisively in heeding ALG’s warnings and successfully prevented the hostile corporate takeover which would have had disastrous national consequences. Because of you, we are actively working toward an America with limited government to maximize your individual freedoms.